ROYAL PYTHON customer collection only. Royal Pythons come from tropical West Africa and so you should be trying to emulate temperatures found in these regions: typically 80-92F. The vivarium should be at least as long as the animal's body and width at least a third of the animal's length. However, we would advise that a vivarium double this minimum size would be preferable in order to provide the range of microenvironments sometimes necessary to reduce the stress in these animals. Cages must be escape proof, easy to disinfect, free of sharp edges, ventilated, and hold heat to ensure proper temperatures. Avoid unfinished wood and porous surfaces when designing custom built vivaria as they will be difficult to keep clean. For heating, you van use variable under-cage heating pads, thermostatically controlled lights and /or under-cage heat strips, and hot rocks. Don't use a small hot rock for an animal that is proportionately larger; burns often result if the animal is forced to rest on this type of heat source. A heat source should warm 1/3 to 1 /2 of the cage with a basking floor temperature of 88 to 92F. Make sure that you invest in a number of thermometers which can be strategically placed throughout the vivarium so that you know what variation you have in the vivarium. The unheated area should never drop below 75F. It may be necessary when using aquariums to cover part of the lid with plastic to maintain ideal temperatures. It is essential to allow the animal an area that provides an optimal basking temperature and a cooler area so that the snake can thermoregulate. Great caution should be used when using lamps. If the heat is extreme it may dry out the animal, create health problems and burn or even kill the animal. It is better to heat with an under cage heater and a lamp. Red lights may be used for heating during the night since this type of light does not disrupt the animals photo period. Avoid large wattage bulbs(100watt+) when possible. The heat provided is often too focused and again may burn. A lighting regime of 12 hours on and 12 hours off is OK. Use incandescent or fluorescent lighting only but never leave visible lights on continuously as this is a common cause of stress. You should provide a water dish large enough to allow the animal to soak in. This should be located near the heat source. Always provide clean water daily and disinfect the bowl at least weekly. A hide box or shelter in the heated end of the cage provides security. A hide box may also be provided in the cooler area. Always locate at least one in the heated end so the animal does not have to choose between security (from a hide box) and a warm area. A climbing branch that has been disinfected correctly is essential. Avoid untreated branches and rocks since they may carry parasites and other diseases. Newspaper, paper towels, paper bags, or artificial grass are safe and inexpensive as substrates. Gravel, sand, mulch and wood shavings may cause health problems such as intestinal blockage, skin lesions and "mouth rot." Please remember that Cedar bark is toxic to reptiles. You should ALWAYS buy captive bred animals whenever possible. Make sure that the animal is feeding when you acquire it. If it is not feeding, there is likely to be something wrong and that may land you with significant veterinary bills! Generally diet consists of mice and rats. Gerbils can be fed also. In the wild, the main prey is birds and small mammals such as jerboas. PLEASE DO NOT feed live food. Small, frequent meals are recommended until an animal is established and no longer a hatchling /juvenile. A baby Royal should begin feeding on small jumper mice (15-21 days old) or rat crawlers. 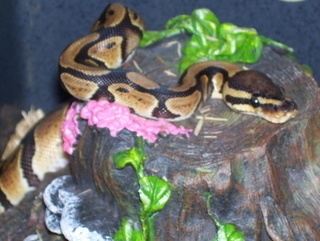 A snake may be induced to feed by placing it in a locking plastic shoe box style container (with air holes) with crumpled newspaper and leaving it for an hour, then introduce a food item. At 18 inches, the snake is large enough to take adult mice or small rats. At 2 feet it is capable of consuming weaned rats. Frequent feedings of 1-2 times weekly will result in quick growth and a healthy animal. Adults often take meals as large as 2/3-grown rats. Offer food items at least once every 10-21 days. Royal Pythons may refuse to feed during the winter months and resume feeding several months later. Shedding is dependent on the animal's growth rate and condition and may occur every month or several times a year. In common with many other snake species, Royal pythons often refuse feeding attempts while shedding. Avoid handling after a sizeable meal as this is stressful and may cause regurgitation Never handle rodents and then handle a snake. The snake may mistake you for food! Develop proper feeding habits and maintain accurate feeding and health records.